A cross between regular poker and online slots, video poker is currently one of the most popular types of online poker games. 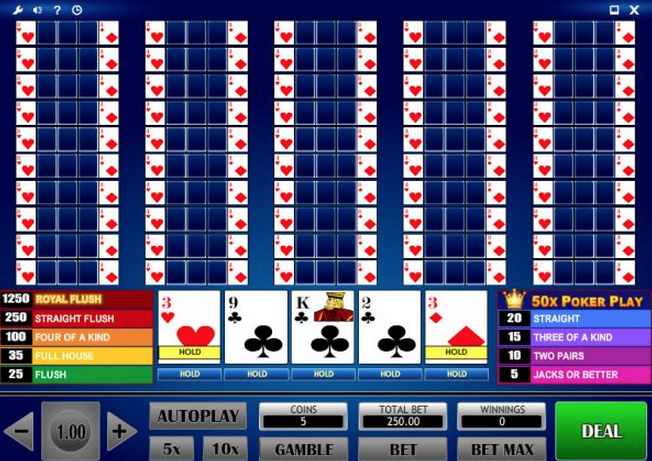 There are numerous variations of the game available, one of which is 50-hand video poker. This is a fun, fast-paced and exciting game and it’s easy to see why so many people around the world enjoy playing it. As the title would suggest, this game involves playing poker with 50-hands rather than the usual one. Playing 50 hands of poker at a time may seem a little extreme and if keeping track of all those hands seems a little too daunting, don’t be put off as the computer puts in the effort for you. Once you get used to it you’ll find playing 50 hands much more exciting than playing just one. 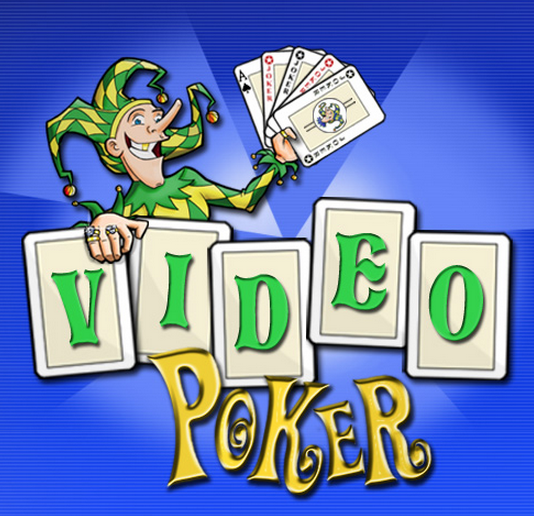 With regular video poker, the game begins with players being dealt a hand of five cards. 50-hand video poker begins in the same way only you’ll be dealt 50 hands of five cards, one of which will be your main hand. Players only interact with the main hand and their decisions on that hand are applied to the others by the computer. When you’ve been dealt your main hand you need to decide which cards to keep and which to discard. The aim is to create a winning hand with the discarded cards’ replacements. The computer will hold your chosen cards on the rest of your hands and replace the un-held ones with new cards. If winning combinations are created by these new cards you win. The more hands you win on, the higher your payout will be. One advantage of 50-hand video poker is that it increases your chances of winning in a short space of time. However, it’s important to note that not all winning hands will be paid out to you in cash. This depends on how many winning hands you manage to get and how much each payline is worth. As each hand uses a different deck of playing cards, it is possible to win or lose with all 50 hands. Players are required to place bets on each of their 50 hands so, for example, if you wager £1 on each hand your final total will be a £50 bet. For this reason it’s sensible to lower the amount that you’d bet on regular poker to account for the extra hands. This does, however, allow players to increase the odds of winning. For example, if you would normally place a £5 bet on a single hand of video poker then you only have one chance to win. But if you place a 10p bet on each of 50 hands then you have a much higher chance of winning for the exact same stake. Many online casinos offer 50-hand video poker and there are a number of different games to enjoy. These are based around regular online poker games such as Joker Poker and Jacks or Better. 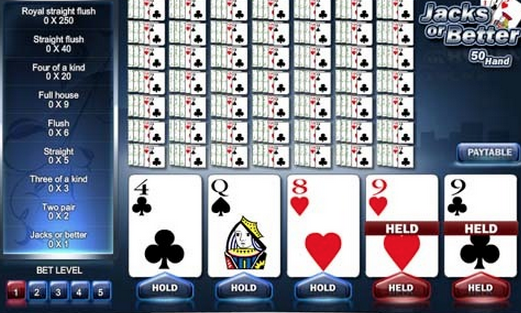 Whichever you choose, you can boost your chances of winning by opting for the 50-hand version of the game.